Day trips in the heart of California will make your conference something special and help boost your conference attendance. Sacramento is centrally located in Northern California. The region is home to more than 200 wineries and tasting rooms, and it is the gateway to the Gold Rush history. It is also bound by two rivers with hundreds of miles of waterways and outdoor activities. 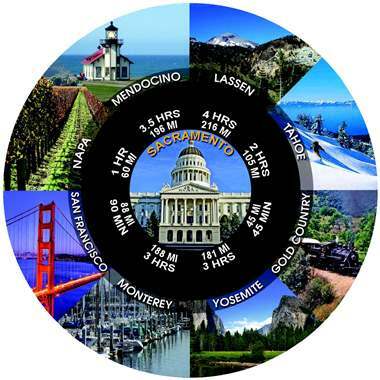 Outside the region, Sacramento is only a short drive from world-renowned destinations such as San Francisco, Lake Tahoe, Napa Valley, California redwoods and Yosemite. One of many FREE services the SCVB provides are partner referrals who assist in pre- and post-trips. That&apos;s where SCVB partner SacTrips.com, the no. 1 source for day trips, comes into play. They research their excursions personally and specialize in locally flavored adventures that are anything but your typical group travel experience. For more information, click here to contact our services team. You may also click on the image above for a full page informational flyer.